Body odor is caused when bacteria on our skin breaks down the acids present in the sweat. Body odor is more prominent in teenagers during puberty. Because at this state, the apocrine sweat glands develop which increases sweat production. The intensity of body odor can be influenced by a number of internal and external factors such as excess body weight, emotional stress, certain foods and medical conditions like diabetes and kidney disease. Deodorants and antiperspirants only mask the stench temporarily but home remedies like ACV reduce the body odor naturally. 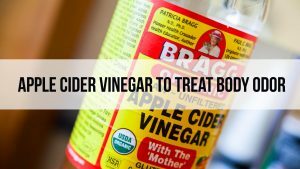 Is Apple Cider Vinegar Useful for Reducing Body Odor? Apple cider vinegar is a highly acidic ingredient that neutralizes the alkaline (salty) environment provided by sweat which in turn destroys the body odor-causing bacteria. Apple cider vinegar also prevents the formation and growth of bacteria that causes body odor. In some cases, body odor is caused by problems in digestion and gut health. Having healthy digestion and a good balance of bacteria in the gut is crucial for the prevention and treatment of body odor. Apple cider vinegar contains probiotics and a type of acid that promotes the growth of healthy bacteria in the gut that improves digestive health. Accumulation of toxins in the body and slowed down the functioning of the liver can also be a cause of foul body odor. Apple cider vinegar is a liver and lymphatic tonic that helps to detox the body by boosting the function of the liver which in turn helps to reduce body odor. How to Use Apple Cider Vinegar to Get Rid of Body Odor? Apple cider vinegar can be used alone or combined with other ingredients as an effective natural remedy for reducing body odor. There are a number of ways to use apple cider vinegar alone to get rid of body odor. Use the cotton ball to wipe the underarms. Wait for 2 to 3 minutes and then take a shower. Repeat this remedy twice daily, once in the morning and once before going to bed. Alternatively: You can add 1 cup of ACV to lukewarm bathwater and soak in it for 10 minutes. Note: Apple cider vinegar is drying in nature, so make sure you apply a moisturizing lotion to your skin after taking the soak. Take 1/2 cup of apple cider vinegar and mix it with 1 cup of water. Spray a small of this mixture to the odorous areas of your body after taking a bath. Use this spray as an alternative to commercial deodorants. Note: Do not spray apple cider vinegar immediately after shaving to avoid burning sensation in the skin. Add 2 teaspoons of apple cider vinegar and a little honey into it and mix well. Drink this concoction 3 times a day before your meals. Note: Apple cider vinegar is highly acidic in nature which can erode teeth enamel, so it’s recommended to drink apple cider vinegar using a straw. It is best to consume apple cider vinegar in diluted form; undiluted apple cider vinegar can cause a burning sensation in the throat. The combination of apple cider vinegar and baking soda helps to flush out toxins from the body and promotes the growth of healthy bacteria that helps to reduce body odor. Add 2 tablespoons of apple cider vinegar, ½ teaspoon of baking soda and a pinch of borax to 1 liter of water and mix well. Sip this drink throughout the day. Consume this drink for 3 to 5 days and then give a break of 2 to 3 days. The acidic property of lemon juice works in a similar way like apple cider vinegar. It lowers the pH level of the skin and makes it difficult for the odor-causing bacteria to survive. Squeeze out the juice of one lemon. Add 1 tablespoon each of lemon juice and apple cider vinegar to a cup of lukewarm water. Dip a cotton ball into the solution and rub it on your underarms. Allow the juice to get into your skin by making sure that it dries on its own. Follow this remedy once daily till body odor is gone completely. Rosemary contains menthol and chlorophyll that have natural deodorant properties. They neutralize body odor and render a refreshing fragrance to the body. In addition, rosemary contains zinc. Zinc deficiency can cause body odor. Witch hazel helps to reduce body odor by lowering the pH level of the skin and creating a hostile environment for the odor-causing bacteria to survive. The astringent properties of witch hazel reduce skin pores and control the production of sweat. Tea tree essential oil has potent anti-bacterial and antiseptic properties that destroy the bacteria present on the skin surface and reduces body odor. Being an astringent, it reduces sweating by shrinking the skin pores. Add 4 to 6 drops of tea tree oil and 1 tablespoon of apple cider vinegar to 1 cup of water. Mix the ingredients well and pour into a spray bottle. Use this spray as a deodorant and apply it after taking a shower or whenever your underarm stinks. Note: Those with highly sensitive skin should not use tea tree oil. Sage is yet another popular herb that fights body odor by reducing the activity of the sweat glands. It is a powerful antibacterial agent that wipes out bacteria from the skin. Use this mixture to rinse the underarms 2 times in a day. When buying apple cider vinegar, make sure that it is raw, unfiltered and unpasteurized with the mother of the vinegar present in the bottle. Undiluted apple cider vinegar is extremely corrosive and can damage the teeth enamel. So, consume it in diluted form and drink it using a straw. Rinse your mouth with water after drinking apple cider vinegar. Applying apple cider vinegar to open wounds or freshly shaved underarms can sting. Apple cider vinegar increases the skin’s sensitivity to sun rays so it’s important to apply sunscreen lotion before going outside. Applying concentrated apple cider vinegar directly on the face can cause skin irritation, redness, and burning. So, it is best to use diluted apple cider vinegar on the face. Use an antibacterial soap to take a bath once every day to wash away the body odor causing bacteria. Change your clothes often and wash your clothes after every wear. Reduce anxiety and stress by practicing meditation and yoga to reduce stress-related body odor. Can you leave apple cider vinegar on your skin overnight? The application of undiluted apple cider vinegar can be harmful to the skin if left overnight. But diluted ACV application can left on the skin overnight. How long does apple cider vinegar take to work? In most cases, you can observe improvement in the first application itself. However, the internal cause of body odor is different for each individual so it’s difficult to state the exact amount of time. So, say goodbye to body odor with these all-natural apple cider vinegar remedies and don’t forget to share your suggestions and experience in the comment section. After applying this and taking a bath, should I still apply a deodorant on my armpits? You can but make sure the deodorants don’t contain any harsh chemicals. Been using ACV for underarms and it works! Ran out of nor will I replinish my commercial deodorant. After the bath, can I apply talc?